Brrr! With temperatures PLUMMETING to a frigid 60 degrees here in L.A., I’m bundling up while I blog. And apparently, I’m not the only one. I recently received a pitch for Digits from Quirky.com, a site that promotes and sells new inventions. Digits are conductive silicone buttons that attach to the fingertips of your glove to allow you to use touch screen devices. 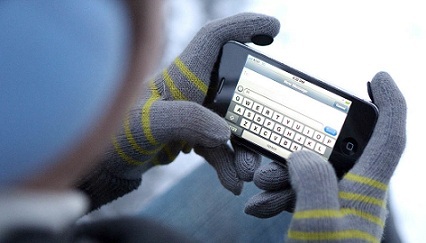 Digits are little pins that you attach to the tips of the fingers of your gloves that allow you to use your iPhone or other touch-screen smartphone or tablet. According to the site, Digits are made from conductive silicone and come in sets of four or eight (the company says you can “use them on multiple sets of gloves or give a set to a friend.”). I also recently received some information from either The Twitten or Twittens. I’m not sure which one—a quick Google search led me to two different companies with similar products. 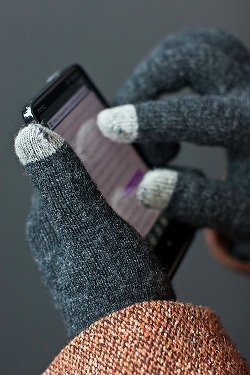 Twittens feature fingertips that fold back to allow you to type or text or Tweet. 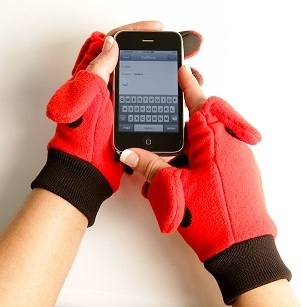 Inventor Lincoln McCardle, working with Canadian producer Impact, developed gloves with fingertips that fold back and secure out of the way while texting or, well, whatever. The site proclaims Twittens great for “cell phones and other mobile devices, photography, handheld video game systems, iGadgets and related touch screen devices, nosepicking, outdoor ATMs, e-Book readers, Braille, outdoor jobs that require handling money or dexterity for other reasons, smoking, panhandlers, portable media players, fishing, hunting” and so much more. 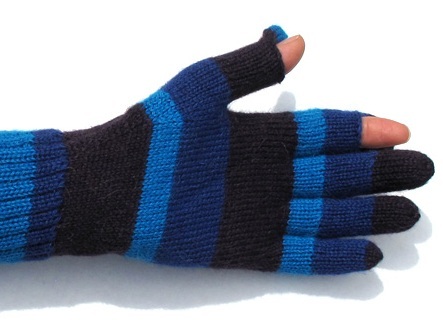 This is The Twitten, the mitten built for two. Good luck typing with it. The Twitten was created by Connie back in the 60s so she could hold hands with her sweetie during cold football games in Pennsylvania. Jennifer works with The Twitten knitters, a group of young women living and working in the Peruvian highlands. The original The Twitten isn’t going to help you with your Twitter habit. For that you need The Twitten’s “Twitter Glove” (for thumb-and-finger typists) or the “Twitter Mitten” (for whole-hand typing). 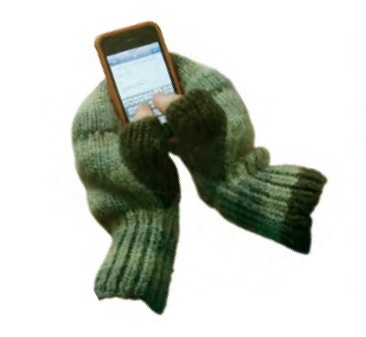 The Twitten’s Twitter Glove (above)and Twitter Mitten (below–both photos) will help with your cold-weather typing—no matter how many fingers you use. 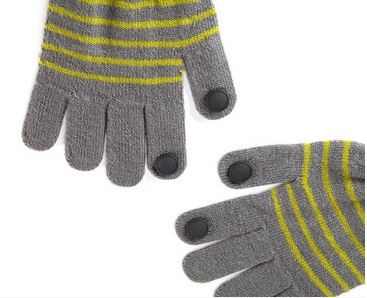 Next, I checked one of my favorite sites for socks and armwarmers: Sock Dreams, based in Portland, Ore. They’ve got something called the Smart Glove, which is made from lambswool with special thumb and index finger tips for using a touch screen. Sadly, the Smart Glove is currently sold out. 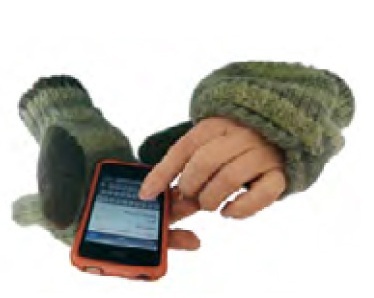 Sock Dreams’ Smart Glove has special finger tips that let you use touch screen devises without removing your gloves. 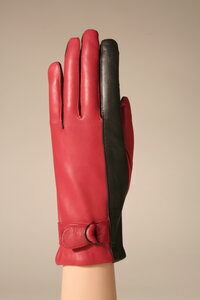 Lastly, I checked in with Los Angeles–based glove maker Gaspar Gloves. Gaspar Gloves has a patented technology that also allows wearers to use touch-screens while still gloved. Plus, the gloves feature antimicrobial properties—for those of you thinking too much about who else has been touching that screen before you. ← NOir or Knockoff? YOU decide.